Since childhood, we’ve been questioning everything! Why is the sky blue or grass so green? Thank goodness we had good elementary school teachers who told us the answers. But now, as we get older, I’ve realized the questions have gotten deeper or more unanswerable. Sometimes we need to reflect and develop. We need to reflect on our past situations to enable us to grow and develop into better people, a better society. We need to evolve from tragedy or confusion with a sense of self. The beauty of TRIAD is that we explore all aspects of growth: Life, Entertainment, Travel, Politics, Environment, College, & Art. Sometimes the more simple questions are perplexing: what’s a good movie? or, should I enroll in that online class? Other times we just need to read an article that shows our point of view, or gives us something to talk about with friends. I hope you will find and enjoy this in the 2007 issue of the TRIAD. To my managing editor, you’re one of the greatest souls I have ever had the pleasure to meet or work with. Your dedication was astounding, and I can never show my appreciation. To the art editor, your passion will propel you far in life: never stop going. To the staff writers, man you’re good! I think you’ve both found your calling. Thank you all and I wish you the best! At the beginning, it seemed so daunting to write this editor’s note. What was I going to write? What was I supposed to say? Then I thought, how difficult could it be? I just have to say how hard we have been working (getting students submissions, those sleepless nights designing, staying at the journalism lab as late as we could, until security actually came and kicked us out because it was very late). But, wait a minute…have I really been working though? I was doing what I love to do. I was learning at the same time. The experience that I have gained will stay with me for a lifetime. It definitely didn’t feel like work. Instead, we were exploring our passion. Our goal was to put together an issue that expresses the different ways people see the world today. We wanted to show how people express themselves. We wanted to give a broad view of what is happening in today’s society. I think we have done it. 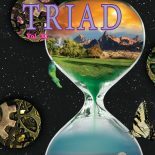 I hope this issue of the TRIAD opens the reader’s mind toward the passionate, bigger, broader and changing world out there. Please enjoy the TRIAD, the fruit of our passion.